is a sense of wonder. Isn’t it amazing that X (whatever you are discussing) works in this particular way?! Isn’t it amazing that X works at all?! How did X come to be the way it is?! Let’s try to get inside of X and really understand it!! Start with the good stuff. The dramatic, memorable, magical, who-would-believe-this- in-a-million-years stuff. The bolts of lightning, Grand Canyon, man-walks-on-moon stuff. Some classrooms hardly teach anything at all. Other classrooms get bogged down in details that nobody cares about or can absorb. The ergonomic way is obviously to move from one crowd-pleasing, show-stopping tour de force to the next, making small, obvious points as you skip along. Boxers say, "Stick and move, stick and move." The Golden Rule here is: if you want students to learn three things, always teach the most interesting one first. The easiest one. The most memorable one. 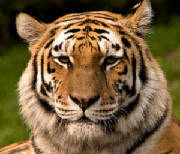 Then the next day, or the next week, go through the same material again, but with a different emphasis and more details. Again and again. This basic principle is fully developed in "26: How To Teach History, Etc." These few paragraphs so far are the gist of "Teaching Science." What follows is a run-down of some of the best stuff from General Science, Biology, Chemistry, etc. Skim for things you find exciting. Everybody has a body. It's the logical starting point. 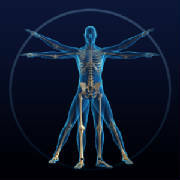 The human body has 206 bones. 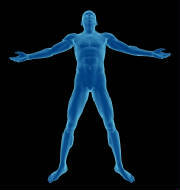 Many of them are in the hands, feet and spine, where they provide essential flexibility. 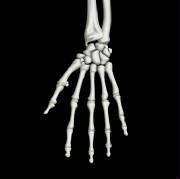 Each hand/wrist has 26 bones. Each ankle/foot has 26 bones. These numbers are crying out to be memorized. 1) The skeletal system, or bones, for structure. 2) The muscles for movement. There are about 700 muscles. 3, 4, 5) Then there are three systems to bring fuel and oxygen to these muscles: circulatory system (heart, etc., shown at right) moves blood around; respiratory system (lungs, etc.) 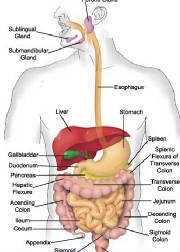 puts oxygen in blood stream; digestive system (mouth, stomach, intestines) puts fuel or food energy into blood stream. 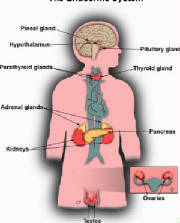 6) Endocrine system--glands to help regulate everything (e.g., pituitary, thyroid). The key thing is the number 8. Students can assemble and disassemble their own bodies. Students can analyze why we need this or that system. It's all fairly logical once they know the number 8. PS: This is really cool. The body has about 250,000 hairs, each with its own tiny nerve and muscle, so that when we are frightened, our hair can stand up. Everything about the brain is amazing. The brain weighs about 3 pounds or 1/50 of the body's weight. But it uses 25% or 1/4 of the energy required by the body. Most people would assume the brain is resting at night. In fact, it's busier than ever during sleep. There's a lot going on in there that we don't understand. Dreams, for example. 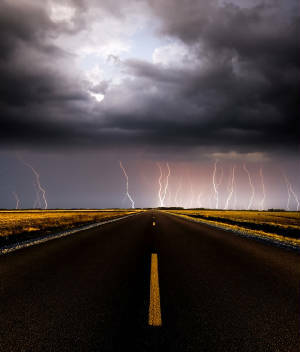 Signals or nerve impulses travel from the brain to the finger tips, for example, at the speed of 450 feet per second. But what do these numbers mean?? One of the most bizarre aspects of modern educational theory is that children shouldn’t be asked to memorize anything. Quackery. First thing to memorize: what is meant by a million, billion and trillion. Without these basic words in mind, science is hard to talk about, not to mention economics, the history of the Earth, or populations of, for example, people in India, fish in the sea, and stars in the sky. A million is one with 6 zeros: 1,000,000 (that is, a thousand thousands). A billion is one with 9 zeros: 1,000,000,000 (that is, a thousand millions). A trillion is 12 zeros: 1,000,000,000,000 (that is, a thousand billions). I wish my teachers had repeated these basics over and over, every day, until I was comfortable with them. As it is, I made myself memorize this stuff, as an adult, so that I could, for example, read the newspaper. Our national output and our debt are measured in billions and trillions now. Everything about the cell is amazing. Every human starts from a single egg cell. This cell divides and divides and divides...Becoming trillions of cells!...Some cells specialize in one direction, some in another direction. By birth there are 200 DIFFERENT KINDS OF CELLS--e.g. lung, heart, skin, muscle, brain, liver, teeth, etc. Red blood cells are among the smallest and simplest--about 2000 of them fit on that red period! 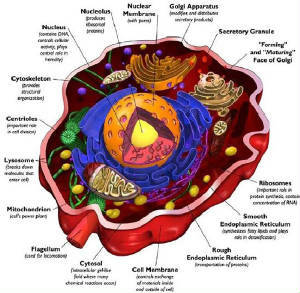 A typical cell is so very tiny...What could possibly be in there? Most drawings show an outer wall, with a nucleus at the center. That's it. Fact is, each cell is vastly complex, as complex as a huge industrial facility. There are hundreds, even thousands of separate parts. Each little part might contain 10 billion molecules. All of this stuff has to be brought in, used, stored, moved around. Which brings us to the main thing: the cell is ALIVE. It is autonomous. Cells can split and reproduce all their complexity in a few hours. Millions of cells are being born and dying each minute. Some of the most WONDER-FULL things appear when we look at the very small (cells and smaller) and the very large (solar systems and larger). A good place to start is with this observation: humans, at roughly 5 or 6 feet in size, occupy a middle ground between the extremes. 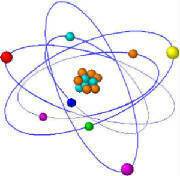 Divide us by a billion (or ten billion) and you are down into molecules. Multiply us by a billion (or ten billion) and we are as big as a solar system. This is a lovely picture. 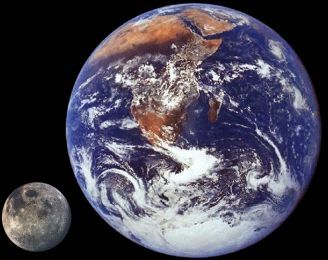 It shows that the Earth (about 8000 miles wide) is roughly FOUR TIMES bigger than the moon. They are shown at scale. What's not to scale is the distance from us to the moon. The moon is 239,000 miles away. About 30 times the width of Earth. Imagine an orbit that is the size of your desk. Or bigger. Everything about the universe is amazing. 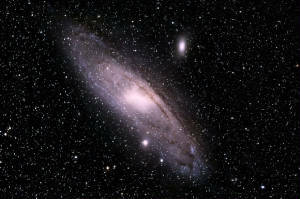 Our galaxy--the Milky Way Galaxy--is said to look like this. About a billion stars. About 100,000 light years across, spinning like a top. And our sun would be a star you can't even see--it's fairly small--about 3/4 of the way out from the center. Here's my favorite all-time rough estimate: there's a billion galaxies in the universe, and each galaxy contains about a billion stars. Amazing. Students need to respect the vast jungle that waits just out of sight. Respect; and also honor; and also enjoy. Nothing is simple, and the closer you look, the more elaborate it gets. Isn't that amazing. I think teachers also need to respect this iron rule in a different way. The details are always there--boy-oh-boy, are they there! More than you can ever master or hope to explain. So why rush to get to them? Why let all those details get in the way of what can be mastered? I see textbooks that are just insane--they seem to want to sketch out the Whole Topic at once. Which is impossible. You have to start with the simplest facts, the fun facts, the easy facts. Build a foundation, even if it's thin. Next day, add to it. Next week, add to it again. Again and again, until finally you have built a very substantial structure, one that will endure. This article takes how long to read? Fifteen minutes? Certainly less than the duration of ONE high school class. And now you know most of the basics that every educated person should know...But try to find a high school graduate, or even a college graduate, who actually knows them. What seems to be happening is that a lot of schools don't try very hard. Or the schools really try but the information is so detailed but poorly organized that it's like building a very tall and elaborate sand castle. A week later nothing much remains. The schools of education aren't helpful. They don't offer courses with titles such as "How To Make Biology Come Alive" or "How To Make Kids Love Physics" or "Teaching Science Made Easy." They should. Future teachers, when in college, should have to major in the subjects they will teach. When they go to ed schools, they would learn how to communicate their specialties with flair, feeling, and efficiency....If our educators were serious about education, you would find these practices to be ordinary. There's another point: this article, and indeed this entire site, is dedicated to the idea that knowledge is good, FACTS ARE FUN, and learning new stuff is enjoyable! Our educators routinely wage war against knowledge and learning, as in their mantras, "They can look it up" or "Why should children know that??" This war shows, more than any other single factor, the intellectual bankruptcy of these so-called educators. For more about FACTS ARE FUN, see "20: The Quizz." Everything I have ever read or heard convinces me that the formula for teaching science or anything else is simply stated: Start Early. Don't Stop. Couldn't much of this article be taught in grades 1-3? Couldn't most of the rest be taught in grades 4-6? Then you'd have children entering middle school or junior high with a foundation, ready to learn a great deal more.  Science enthusiasts will also enjoy "17: Understanding Robots."